The Cisco Catalyst 2970 series switch makes the perfect service improvement for small and medium businesses as well as enterprise branch offices. Entering its EOL stage, used Cisco C2970 switches still allow networks to expand their last-mile reach with options to scale past 100 Mbps over copper cabling. Each unit still provides significant network intelligence to assist with data security, scaling and support for controlling and differentiating traffic flows. These models remain robust enough to respond to demands in modern networks from the core to the WAN. Private VLAN Edge features can also isolate ports on a switch to help best manage your traffic. Worldwide Supply thoroughly tests and warranties its full selection of used Cisco C2970 series switches with rigorous checks in real-world environments. Your equipment will perform like new while providing you with savings of up to 80% off the original OEM pricing. 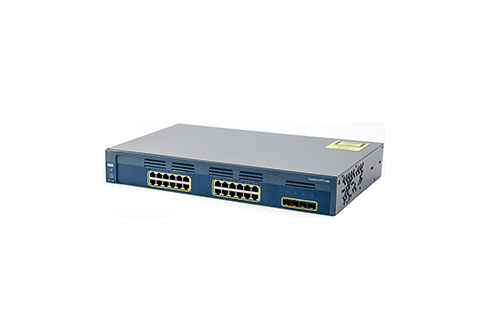 Worldwide Supply also offers a lifetime warranty on used Cisco C2970 series switches as well as compatible optics and accessories. Our selection of used Cisco C2970 switches is curated to help customers support the multi-gigabyte demands that are growing across all sectors. Whether it’s backup systems, database management, video or other streams, your customers are driving more traffic — and your network needs to keep up to keep them satisfied. Upgrade every aspect of your system to Gigabit Ethernet speeds to address today’s challenges with a set of Cisco C2970 refurbished switches. The same Cisco C2970 switches can also enhance your network intelligence thanks to these higher speeds. It’s easier to run additional security and QoS, as well as maintain high availability throughout the network core and edge. Have the space you need to protect client information, meet critical demands and spikes, scale over time and control traffic to handle changes in your business applications. Used Cisco C2970 switches still support the company’s enhanced image software to support multi-layer services. It’s a smart choice for networks that need identity-based services for applications including real-time streaming of media and IP telephony. All models feature multiple high-availability features designed to reduce your downtime. Protect mission-critical applications and stay running to reduce your total cost of ownership with PVST+, UplinkFast and PostFast. Used Cisco C2970 series switches still have a role in the larger family of Cisco switches. The C2970s can be stacked or operated in conjunction with a variety of other Catalyst models, including the 2940, 2950, 2960, 3550, 3560 and 3750 series. You can use the same management tools for all units, simplifying your overall control and support. Cisco’s fixed configuration switches also work with its modular Catalyst switches. Fire up the Cisco Network Assistant or other configuration support tools to manage your network and see where you can include an additional used Cisco C2970 series switch. Considering a used Cisco C2970 but not sure how to safeguard your network with older equipment? Don’t look for third-party coverage for just this component. Instead, turn to Worldwide Supply for a comprehensive maintenance support package designed to be vendor-neutral: NetGuard. Our NetGuard maintenance service covers more than 200 current and legacy OEM product lines with a global, state-of-the-art technical assistance package. Experts are available 24/7 to provide personalized solutions for your network and needs. We also offer same-day and next-business-day parts and products for most locations across the globe. You might also qualify for 4-hour on-site spare services and field support mobility solutions. Bring all of your repair and maintenance needs under a single contract, with access to leading parts and replacements, by working with us and saving 50% to 80% off your recurring network and IT maintenance. Not only does Worldwide Supply have a deep inventory of used Cisco C2970 switches and other networking equipment from a variety of OEMs, but we also purchase used and refurbished networking equipment. Expand your network or turn your surplus equipment into cash by selling or trading it directly to Worldwide Supply. With options for cash, trade-in and rentals, you’ll receive the maximum price — we’ll even take care of all the equipment pickup and site removal! Contact us online or by phone at 888.328.2266 to learn more about how we can maximize your savings. Request a quote on used Cisco C2970 switches by adding it below to your quote cart.